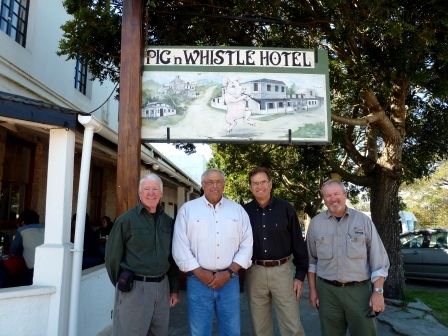 Bill Satterfield, Dave Kjelstrup, Alex Good and Paul Latchford were still on safari heading north hoping to carry on from where they left off in the south. 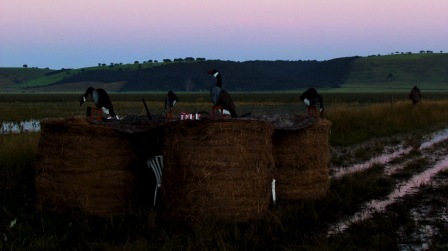 Arriving in the north, the guys settled into camp before the afternoon’s hunt was set to begin. 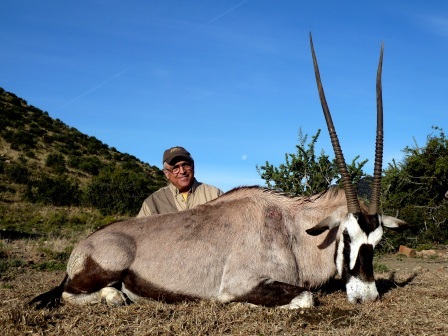 Professional Hunter, Juan MacDonald, together with his hunters, Alex and Paul, were after Gemsbuck and Springbuck. 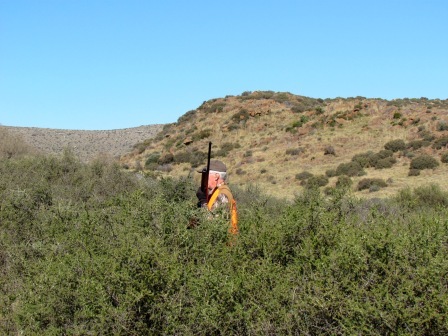 Dave was on the hunt for Cape Hartebeest, Gemsbuck, Eland, Mnt Reedbuck and Springbuck, while Bill would soon be joining the hunt with a day of upland birds over English Pointer. 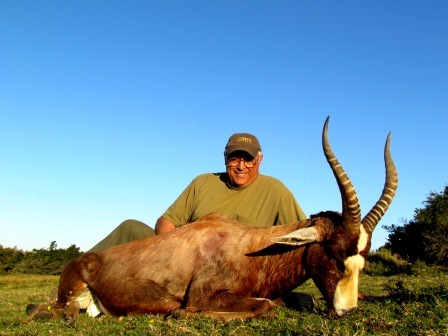 Alex was the first to strike gold – A superb Gemsbuck. Paul soon followed with a bull of his own. Dave was finding the north slow at first, we were spotting game, but weren’t getting those lucky breaks we’d become accustomed to in the south. We were forced to hit the mountains in search of game. 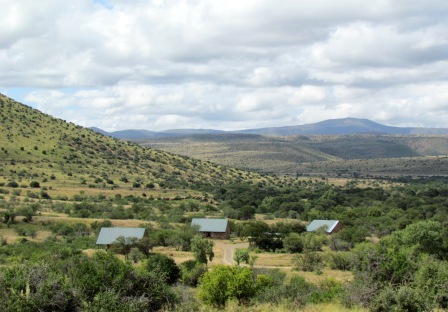 We finally spotted a heard of Gemsbuck across a small valley, feeding on the next plateau. We left Bill to shelter and made the final ascend. Dave was finding the terrain hard, as loose rocks were making conditions under foot extremely difficult to navigate in. We finally got into position and Dave added to his tally of one shot kills. 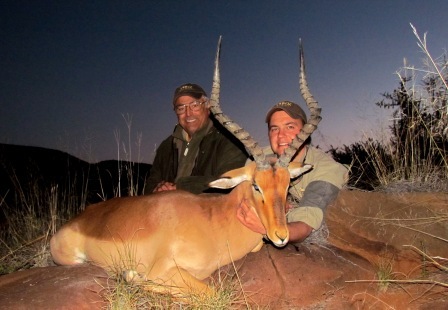 Day 5 was capped off with a great late afternoon Impala. The following morning was a slow one, the previous evenings party had been good, possibly too good. The mornings hunt saw us coming up empty-handed, so we decided to head back to camp for lunch. On the way back to camp Boy spotted a group of Mnt Reedbuck bedded down in a secluded valley. A closer inspection revealed a ram worth pursuing. We edged our way along a wooded area and came up and over, looking down for the hidden animals. Once we’d spotted them it was a matter of patience. 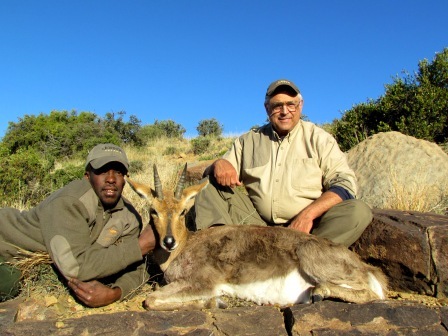 Boy and Dave with Dave’s old Mnt Reedbuck ram. The bow hunters hadn’t run into any sort of luck during the course of the morning. The area was massive, making it difficult to locate the required game. 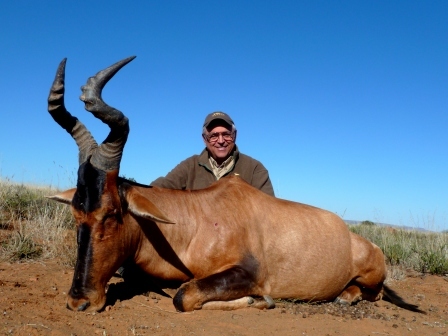 Whenever we were after Eland, all we could find was Springbuck and tons of Gemsbuck, while the other crew was finding loads of Eland. We decided to join forces and plan our attack for the afternoon. If we could help each other by spotting game the other was after, we could cover double the distance in half the time. We headed out. Within hours our plan worked! 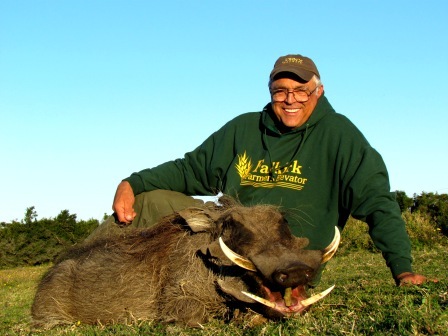 Dave coming away with a monster Cape Hartebeest. Day seven saw us rising to a windless morning, the perfect start to a day of upland birds. 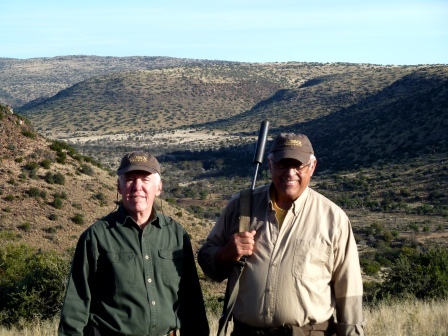 Bill and Alex joined me, while Juan, Dave, and Paul were on the hunt for Cape Springbuck. The bird hunters travelled 45 mins north to Niel’s place, ready for an enjoyable morning. 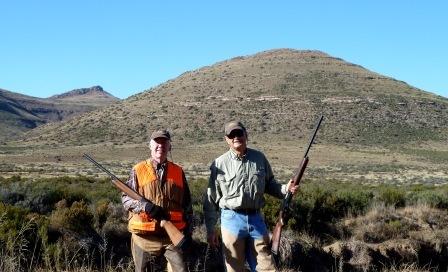 The bird hunters were after Grey Wing Partridge, a small covey bird living on the high ground at + – 5000 feet above sea level. 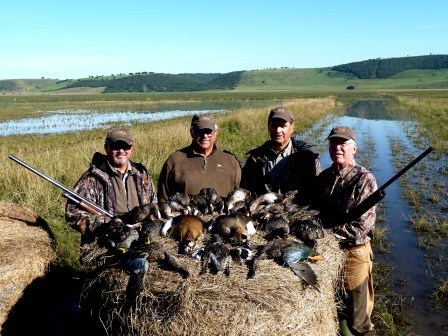 These birds are wild and are hunted in their natural terrain, making for exciting shooting over trained English Pointer. 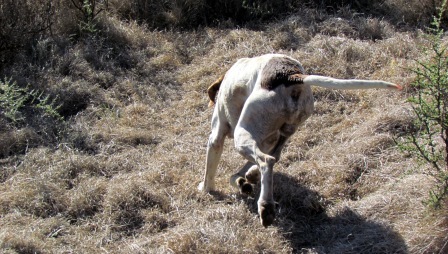 Our English Pointer, Bones, is a camp favorite and a great character to have around, the fact that he’s really good at what he does only adds to the excitement and the hunters’ entire experience. Bones kept us going for 5 hours without a single break. Now that’s hunting by an old dog. The terrain often tested us in various ways, Bill soon finding himself head high in brush with Bones on a point. While our morning was a slow one, extremely strange for that particular area, we enjoyed a great laugh. During midmorning while flushing a covey of Grey Wing, Bill soon knocked down the lead bird, only to see Alex follow-up on the double with an escaping Jack Rabbit! Needless to say we were rolling with laughter after seeing the blank expression on Bones’ face! On the other side of the mountain things were going pretty well. 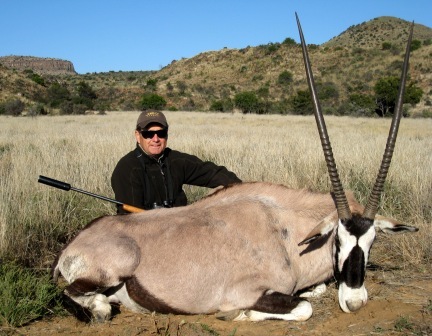 Dave had hunted a Cape Eland and both hunters had lucked into Springbuck. 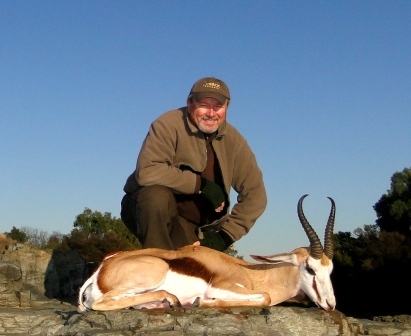 A happy Paul with a well-earned Common Springbuck. 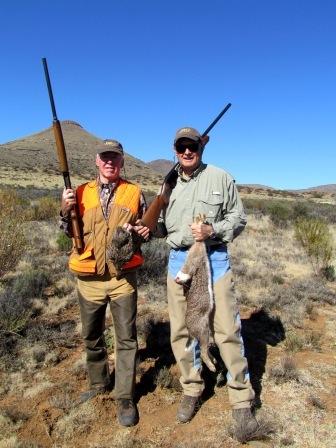 Our time in the Karoo had come and gone so quickly, we had spent 3 enjoyable days hunting some of the biggest open country that Africa has to offer. Before heading south we said our final farewells; it was truly a fantastic place to have hunted…. Day eight would still provide many adventures. The day was young and the Land Cruiser felt strong, eating away at the many miles south. Arriving back south in time for the afternoon hunt, we got onto a roll like I haven’t seen in years. 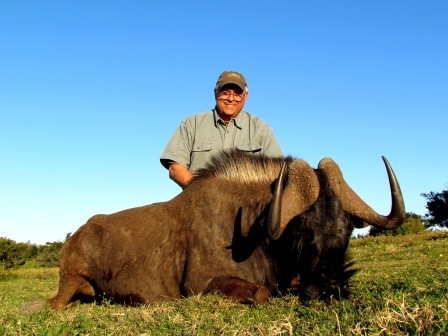 Dave first dropped his Black Wildebeest with another well placed shot. A great bull to add to his growing trophy collection. 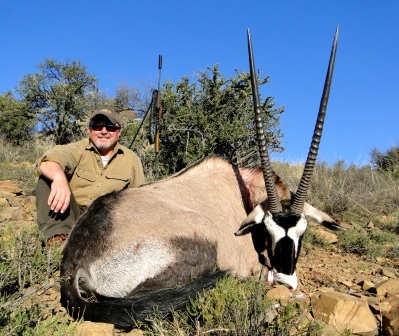 Having taken a liking to the bow hunters Blesbuck, he was keen on hunting a ram of his own. And when we had all called it a day and were heading back to the skinning shed, that familiar whistle rang out from the back. Boy had spotted something. We dropped off the rest and headed out again. Dave’s much wanted Warthog was what Boy had spotted. Needless to say we were all worn out after such an eventful day. 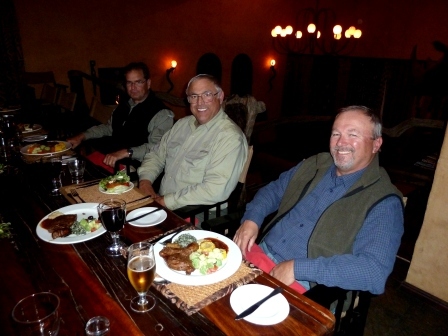 That evening saw us enjoy a well-earned dinner back at base camp, reliving the stories of what had been thus far. 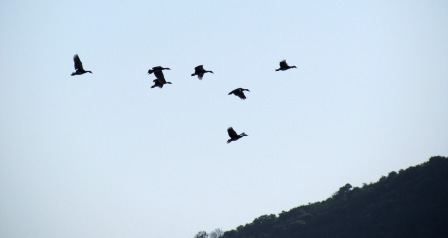 Day nine saw us rise at 4am, we were going waterfowl shooting. The guys enjoyed a successful morning, with a personal highlight, seeing Dave use the callers with such skill. We were told he was the North Dakota champion; we now know he really is! Apart from Dave’s great calling it seemed these guys could shoot just as well. 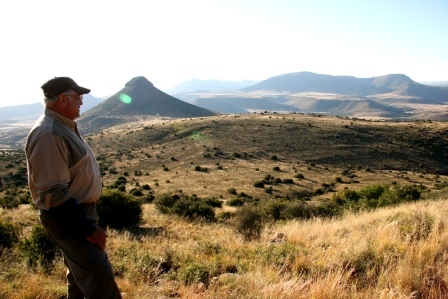 That afternoon we set out for the last time trying to find Alex a big Kudu bull. We had taken on so much, in the end we simply ran out of time. With the setting sun, Juan and I decided to introduce our new friends to an entire different world. We hooked up the spotlight and brought the night to life. We spotted Jackal, Springhare, Jack Rabbit, Aardwolf, Bushbuck, Kudu, Bat Eared Fox, Porcupine and a host of birds. 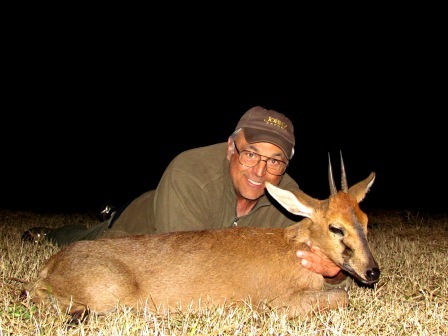 Dave bagged this beauty of a Common Duiker to end what had been an amazing hunt. Our last day of our hunt was put aside for R&R. We headed down towards the coast on a meandering pub crawl, stopping in at the many water holes along the way. 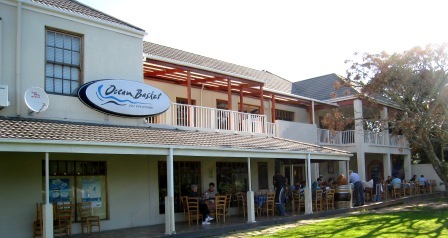 Including the pub with the longest standing liquor license in South Africa. We then capped it off with a seafood lunch on the ocean. 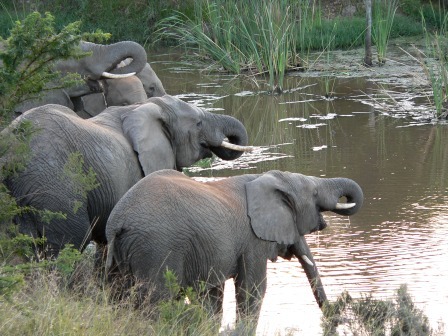 And finally a Big 5 Game Drive – Spotting Lion, Elephant, Hippo and Giraffe in the same afternoon. So you cost me a buck and you never even knew it. Value for money, I’ve never had that much fun with any one group before. Both Juan and I still find ourselves laughing at the many crazy things you guys did. If Alex wasn’t inventing a new species on a daily basis, he was practicing trick shooting with his rifle and bow, how else could one explain the mayhem. If Dave wasn’t taking on every hunter and his mother, then Paul was there to edge him along even deeper into another bet. As for Bill, the elderly gentleman who came strolling down the aisle and cost me a buck. I’d gladly pay that buck again!